This holiday season, treat the little Star Wars fan in your life to a unique adventure with a new personalized Star Wars book for kids! 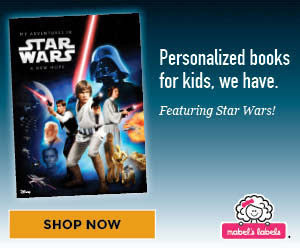 In the Mabel's Labels Personalized Book: My Adventures with Star Wars, Princess Leia is being held hostage by Darth Vader and the Imperial Forces. The star of the book helps Luke Skywalker, Han Solo, R2-D2 and C-3PO rescue the beautiful princess and help the Rebel Alliance restore freedom and justice to the Galaxy.